The humanitarian crisis presented by lives disrupted by the civil war in Syria, drug driven corruption in Central America and Mexico, chaos arising from the invasion of Iraq and Afghanistan, and the poverty driven multiple crises arising in Africa from dysfunctional governance, the failure of the rule of law, hyper-exploitation, and environmental degradation must be met with the kind of generosity that helped make America, a nation of immigrants, dynamic, creative, entrepreneurial, and wealthy. Refugees don’t leave home because they want to; they leave because choices have run out. People who come to one’s country to seek refuge from oppression, violence, chaos, or poverty when welcomed wisely can bring enormous benefits. Refugees or immigrants are often castigated because they are different, but in today’s world, with education and motivation, an immigrant population in one generation can excel. One need only look at the vast number of people from India or South Korea bringing enormous benefits to host countries. Responding to today’s crises on the human and immediate level is imperative and homes must be found, but that does not sufficiently address causes. 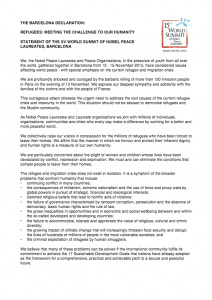 The policies advanced by Nobel Peace Laureates address the root causes of most of these crises.  The Peace Laureates and Laureate organizations focus on human rights, gender equity, environmental responsibility, peace and security, conflict prevention and resolution, and disarmament. They serve as examples of how solutions can be obtained and resources redirected by ending war, diminishing the reliance on weapons and violence, particularly threats of nuclear annihilation, and promoting sustainable development and peace. The policies of the Laureates are what the world needs to prevent future refugee crises. Peace is the currency of their lives and peace is both the solution and methodology of its achievement. 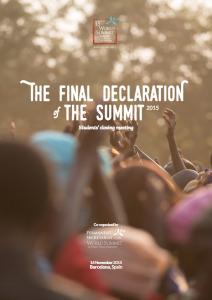 For three days in Barcelona some of the world’s most inspiring successful advocates of social, political, community, international, and personal peace will gather and address present challenges with inspiration and practical solutions. Barcelona City Council. Plaça de Sant Jaume s/n. 12.00 Press conference. Saló de Cròniques. University of Barcelona. Gran Via de les Corts Catalanes 585. Palau de Congressos. Fira de Barcelona, Recinte de Montjuïc, Avda. Reina Maria Cristina, s/n. 09.00 Gates open for the general public. 09.00 Gates open for general public. 09.30–10.30 Session 5: World Peace. Living it. 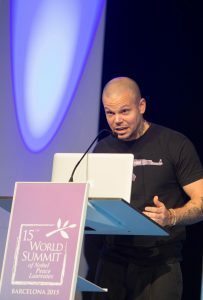 Rene Perez is the lead singer of Calle 13, winner of the urban hip hop and rap sound. They have won 19 Latin grammy in 2011 and 5 in 2014, the nobel of music. The most laureate urban band music. Born in Puerto Rico and based in New York they have campaign with Amnesty International and UNICEF. This very young band represent the youth of the Latin American continent that strive for a better world. They have campaign against the war in Afghanistan, Irak and Siria. They have defended Latin American unity against foreign intervention and they fight for soverignity, first and foremost of Puerto Rico. They have publicly denounced the coup d’etat in Honduras in 2009 and defended grassroots democratic movements. They keep alive the historic struggle of those who fight for a better world like the massacre of in the square of three cultures in mexico 1968. A very young urban band that sink its roots in the fight for democracy in latin america as well as social justice. They have plaid freely for the madres de la plaza de mayo in Argentina and they have openly campaign against demilitarisation and to stop arms trafficiking. This is only a short example of why the Laureates of the Nobel Peace Price want to thank Rene Perez of Calle 13, Residente of the barrio! Arcadi Oliveres Boadella was born in Barcelona in 1945. He studied Economics at the Universitat de Barcelona and achieved a PhD in 1993 with his thesis titled: the Defense Economy Cicle. In his thesis he explained the relation between the public expense for military issues and the armament industry. After this, he gained admission to the Department of Applied Economy at the Political Science Faculty at Universitat de Barcelona. In his younger years, Arcadi was involved in several social and catholic movements, fighting in favour of democratic and the political freedom during the Spanish dictatorship. He was member of the Sindicat Democràtic d‘Estudiants (Democratic Students Union) and during the 70’s he participated in the Assamblea de Catalunya (Assembly of Catalunya). With this association in the summer of 1976, he organized the Marxa per la Llibertat (March for Freedom) all around Catalonia, claiming “Llibertat, Amnistia, Estatut d’Autonomia” (Freedom, Amnesty and Autonomy Statute). 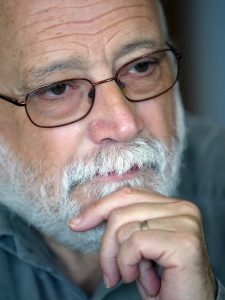 In 1981, Arcadi started to work at the organization called Justicia i Pau (Peace and Justice), a Christian organisation dedicated to promoting human rights and peace. Since then, Arcadi Oliveres has been an active member and in 2001 he was elected president of this organization. He participated as a teacher of co-organized courses at Catalan Universities in El Salvador, Nicaragua (Universitat Autonoma de Barcelona) and in Bolivia (Universitat Pompeu Fabra). He has been and still is a regular guest on the radio – programmes such as Catalunya Radio, Catalunya Informació, COM Radio, Ràdio-4, Ona Catalan and many others. Apart from his numerous activities, he has also been writing columns for several magazines like Canigó, Serra d’Or, Diari de la Pau, Diari de Sant Cugat and also in Diari Avui. He has participated in more than 60 books and publications.